More than 2.5 million people face hunger in drought-stricken areas of Afghanistan despite billions of dollars of aid that have poured into the country in recent years, aid agencies say. 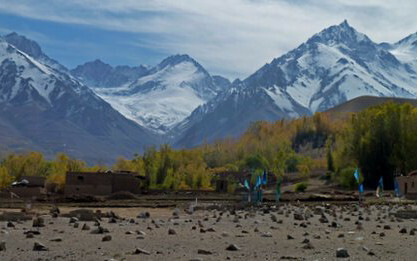 Many villagers have only limited supplies of food left as winter looms, as the BBC's Mike Thomson reports from the central province of Bamiyan. In the far north of mountainous Bamiyan Province, to the east of the capital, Kabul, a mother sits in despair with a small boy on her lap. Bibi Nakiba tells me that all she has left is some dried fruit and a few potatoes. "Whatever we have in our house we give, but we've come to the time when there is little left. We have to say no to our children, there is nothing for you. Sometimes they cry because they are so hungry." She fears that things will only get worse as snow, which already caps the many mountain peaks surrounding her village, cuts her isolated community off from help. "We've sent so many messages to the government about our plight but they never listen. Our children could die here this winter," she says. "Even if our neighbours have food they would not be able to help us because they will need all they have for themselves. In these times everyone has to think of themselves, not others." The UN's World Food Programme (WFP) says harvests in some areas have been almost completely wiped out, doubling the price of wheat and causing other food prices to soar. Some 90% of households in affected areas are living in debt and many schools have closed because children have been sent to find work. The WFP says only half the funds needed were raised after an earlier appeal for assistance. Bibi lost everything she owns in the spring when floods, which preceded the drought, washed her home away along with everything she owned. She now lives with brother, Abdul Kadir, and his family. They too are struggling. Abdul says his crops failed, many of his animals have died and local food prices have soared. His community, he says, has had no help at all, either from the government or international aid agencies. Yet he has heard on the radio that large sums of aid have come to his country, though not, Abdul insists, to peaceful areas like his. "There is no fighting here and nobody cultivates poppies. All the international aid seems to go to Kandahar and Helmand, none of it comes here," he says. "Maybe people in those provinces are powerful, or maybe because they are fighting they send all the aid to them." Abdul's theory may not be far from the truth. Aid agencies have been concerned for some time about the amount of aid directed towards conflict areas of Afghanistan. Much of it is designed to win hearts and minds through "quick impact projects" in insurgency-plagued provinces in the south and east of the country. According to a US Congressional study, 80% of US aid has gone to troubled regions. For example, last year Kandahar province received four times more US aid per head than Bamiyan, while the equally quiet neighbouring Daykundi province saw five times less. It is a policy that is roundly defended by the US ambassador to Kabul, Ryan Crocker. "We have put substantial assistance into the south. You know, we are trying to end an insurgency here and that means, in part, funding a better future and giving people alternatives," he says. "You know, that's part of a counter-insurgency strategy." Oxfam's policy and advocacy director in Afghanistan, Louise Hancock, insists that such a policy means that political and military objectives are often being allowed to outweigh humanitarian need when the allocation of aid is decided. "Militarised aid is a major issue here. They are aiming on winning hearts and minds by implementing quick fix, quick impact projects," she says. "These result in schools being built in areas where there are no roads going to them, where needs are not at their greatest or where there are not enough teachers to staff that school. This is what we say should not be happening." Other aid agencies, including Save The Children, take a similar view. They further argue that more longer term development aid is needed and that blurring the lines between aid work and military objectives puts their staff, as well as the people they help, at more risk. The UN World Food Programme's country director in Afghanistan, Louis Imbleau, refuses to get drawn in to what he regards as "politics" but is passionate about the urgent need to help those here suffering from drought. The UN, he says, has already supplied more than 20,000 metric tonnes of food to the country's worst-affected areas, but more is urgently needed before the snows fall. If it does not arrive in time, Mr Imbleau insists, malnutrition could cause permanent damage to the health of many of Afghanistan's children. "They will not achieve either the physical stature they could as well as the mental ability. It could reduce their IQ by upwards of 15 points, which is substantial," he says. "It's very sad, it's irreversible and should just not be allowed to happen. It should not be allowed to happen." Afghanistan's government and foreign donors spend barely $10 a person on health, despite pointing to it as key to winning back support against a worsening insurgency that has dragged on for nearly a decade, a study said Sunday. The other $31 per person that makes up the country's meager health spend comes from Afghans themselves, many of whom struggle to provide doctors and drug care for their families from the $426 per capita they earn each year.